Wool Felt Bonnet. Black or Gray. One Size. 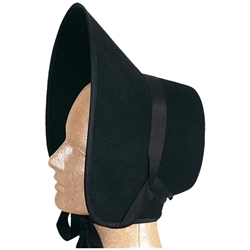 A very high quality, heavy wool felt bonnet that can be used as is, or as a base to be decorated or covered. This bonnet is often used for the mission costumes in "Guys and Dolls" as well as for period shows like "Little Women", "A Christmas Carol", "Oliver! ", etc.